Dr. Olarte’s practice is concentrated on both surgical and nonsurgical approaches to reconstructive and cosmetic concerns of the nose, face, and neck. Dr. Olarte earned her bachelor’s degree from Barnard College at Columbia University, after which she went on to receive her medical degree from the University of Medicine and Dentistry of New Jersey. 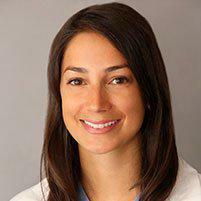 Dr. Olarte completed her internship and residency in Otolaryngology-Head and Neck Surgery at Mount Sinai Hospital in New York City, where she learned the intricacies of head and neck anatomy and the essentials of managing disorders of voice, hearing, and paranasal sinuses. Dr. Olarte finished her training in a Facial Plastic and Reconstructive fellowship endorsed by the American Academy of Facial Plastic and Reconstructive Surgery in Richmond, Virginia. This additional training included extensive experience with primary and revision rhinoplasty, the latest techniques in facelift and neck lift procedures, and eyelid and brow lifting. Dr. Olarte’s goal is to help bring out your natural beauty to achieve your most confident self by addressing all aspects of the aging face. Dr. Olarte has participated in International Medical Missions in Costa Rica, Ecuador, and Mongolia providing necessary care for patients and leading educational initiatives for local professionals where lack of access to education, medical care, and advanced technology has a significant impact on healthcare. Additionally, Dr. Olarte has contributed to many conferences with both the American Academy of Facial and Plastic Reconstructive Surgery and the American Academy of Otolaryngology – Head and Neck Surgery, with a particular interest in women’s issues in medicine. Dr. Olarte joined Dr. Michel Babajanian in practice in the fall of 2015. Dr. Olarte and Dr. Babajanian both received their training in Otolaryngology-Head and Neck surgery at the Mount Sinai Hospital in New York City. Mount Sinai Hospital has long been a leader in the clinical and scientific advancements within the field of Ear, Nose, and Throat medicine. Incorporating the most innovative developments from generations of leaders of head and neck disorders, Dr. Babajanian and Dr. Olarte ensure a complete and state of the art approach to your healthcare needs. Please call our office if you have any questions or concerns regarding the various insurances that we accept.